When I edit a slide show it easy to copy whole slides in Working Screen Environment but nice to preview slides in SlideShow Screen Environment. 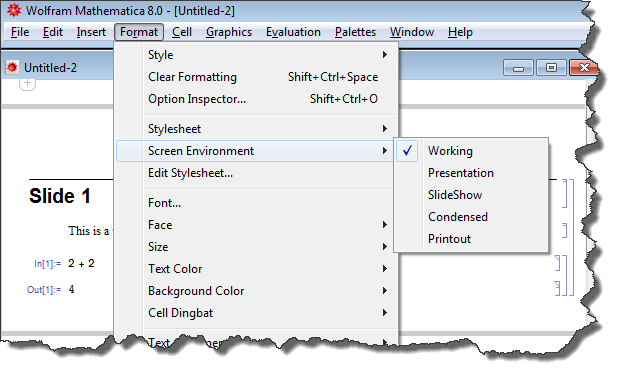 Mathematica has convenient interactive buttons to go to Full Screen mode and change slides. Is it possible to set up an easy button or hot key to switch between Working and SlideShow Screen Environments to avoid trips to menu? Maybe using DockedCells ? Any similar ideas ? This is rudimentary so you can play around and choose your keys etc. but it seems to do what you want (it worked ok for me with 8.0.4 on OS X 10.6.8). When I wrote this answer I chose "s" and "w" keys for "slideshow" and "working" just for example. Clearly it is not practical to tie up the "s" and "w" keys at the notebook level. However the next day I tried to make these event keys function keys and couldn't get it to work so contacted WRI tech support. They advise that there is no (documented) way to use the shift, option, control, and function keys with EventHandler. Further they said there is no way to use key combinations with EventHandler. So therefore the stylesheet method that I posted the other day looks like the best way to (practically) achieve what you want. Firstly make the docked cell grid. I'm using PaneSelector rather than If to choose how to layout the docked cell. An alternative is to create two separate docked cells, one for working and one for slideshow. This seems easier. This has been cobbled together after studying how other slideshow docked cells work. Note the red EvalutionOrder option to EventHandler. This places the option (button, i.e. the disk on the left)) to go full screen from the working environment. You can switch between slideshow and working via the docked cell by clicking on "Switch to Working" and "Switch to Slideshow". From there give it a name and install it. You could edit the MenuSetup.tr file in the same manner as KeyEventTranslations.tr to include shortcut keys for each mode. At present I cannot see a way to make this actually work. I am leaving the answer here for a while in case someone else can, and because I am curious to know what can be done with the "MenuListScreenStyleEnvironments" token. For something really straightforward, could you not just use the built-in Slide Show palette? It has a View Environment button that allows you to select Slide Show, Working, Presentation, etc., from a drop-down list. Of course this is not appropriate if you want your slide show view to be full-screen. But if you're toggling between slide show and working, it's likely this is something you might be doing during development of your notebook rather than during its presentation to an audience. Not the answer you're looking for? Browse other questions tagged front-end or ask your own question. How do I clear all user defined symbols? How do I find all the possible events that work with EventHandler? Stretch Grid to fit width of containing object? How to create a workbook type notebook?